Elder Jeffrey R. Holland and his wife, Sister Patricia Holland, returned to New Haven, Conn., where they lived for more than two years while he pursued a Ph.D. at Yale University. During that time he served in the presidency of the Hartford Connecticut Stake and she served as Relief Society president of the New Haven Ward. During their return visit on Sunday, March 18, they spoke to members of the New Haven Young Single Adults Branch, who were joined for this occasion by married students as well. In a separate devotional, they spoke to the New Haven Connecticut Stake's young men and young women of priests and Laurel age, along with their leaders and their parents. 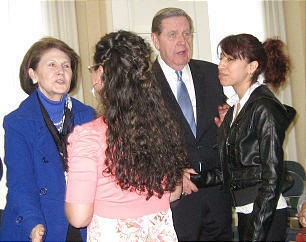 Both meetings were held in the New Haven Institute Building on the Yale University Campus, which Elder Holland had dedicated 10 years earlier.